We are a whole team coming together to create this learning journey. Each of us brings in a different perspective and experiences to create a complete experience of yoga. Laurence Gilliot has been teaching and practicing Yoga and Meditation for the past 10 years, organizing retreats in Europe and Asia and facilitating Yoga Teacher Trainings for the past 6 years with Pranaya Yoga and Jivani Yoga. Laurence is a natural teacher and facilitator. With a dedicated practice to yoga with a wide variety of styles and gifted teachers, Laurence sees yoga as a journey home, reconnecting us to the deepest parts of ourselves, with our breath, humour and self-love as travel companions. Her classes embrace a variety of traditions: Anusara, Vinyasa, Restorative yoga, Ayurveda and Yoga Philosophy. Her alignment cues and intelligent sequencing help her students to safely deepen their practice. 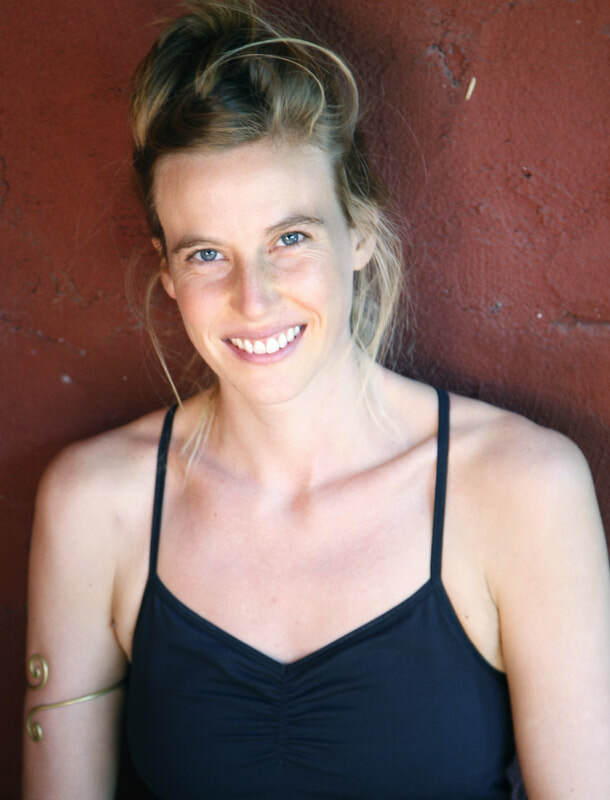 She has been co-teaching for 3 years with Emma Warmington, Director of Jivani Yoga, and is so grateful for everything she learned from Emma in terms of facilitating Yoga Teacher Trainings. Laurence is passionate about the physical and emotional therapeutic aspects of Yoga using Ayurveda and mindfulness techniques to work with the mind. Her embodied knowledge of Yoga Philosophy connects her students to the roots of Yoga and invites inner inquiry. She is appreciated by many students for her gentle and compassionate presence. When Laurence started to practice yoga, it had a profound impact on her life. At that time, she was working in an international non-profit organisation, facilitating community conversations, from remote villages in DR-Congo to slums in the Philippines to violent neighborhoods in Papua New Guinea. She saw that she could greatly contribute to this world not only by helping “poor” communities but also by transforming her own emotional luggage and by sharing her practice with others. Meditation in motion has been a common denominator in Laurence's life. She completed a 5-month walking meditation in the Himalayas. She also facilitates Conscious Communication workshops and is a certified facilitator of Dance Mandala, an ecstatic dance expression, where participants listen and follow the body's intuitive wisdom. Since 2006, Laurence has practiced Buddhist mindfulness meditation with Zen-master Thich Nhat Hanh and she co-facilitates a weekly meditation group in Chiang Mai. Laurence coaches individuals and groups based on an intuitive approach. During the training, she will guide students by sharing powerful personal development tools, allowing for transformation from the inside out. Rosemary Bolivar is founder and Co-owner of Wild Rose Yoga Studio in Chiang Mai, Thailand. It is from these cross-roads of South East Asia, that she has been able to cultivate the breadth and knowledge of her experience in yoga and as well collaborate with practitioners in Thailand and on an international level. Gernot Huber has been practicing yoga since 1996 and has been teaching yoga full time since 2009. In his teaching and in his personal practice he focuses on fully embodying every pose through a breath-centered approach that balances body and mind, precision and creativity, introspection and bliss. Grounded in Anusara yoga, Gernot has developed his own approach to yoga, incorporating insights also from Iyengar, Ashtanga, Forrest, and Kripalu yoga, from yogic and Buddhist philosophy, and from Western anatomy, physiology, and neuroscience. He skillfully integrates down-to-earth discussions of alignment, anatomy, and awareness to convey the key concepts of yogic philosophy with clarity and humor to practitioners of all levels, helping you create a more balanced practice by emphasizing the transformative power of yoga on the mind as well as the body. Born in South Africa and raised in Germany, Gernot spent twenty years in the United States and now divides his time between the US and Thailand. Gernot holds a bachelor's degree in Modern Thought and Literature from Stanford University and a master's degree in Ecology and Evolutionary Biology from Cornell University. In his teachings, Gernot draws on a broad range of life experiences that includes working in Silicon Valley, traveling extensively in Asia and South America, volunteering for antiglobalization and alternative-transit non-profits, conducting biological fieldwork in California's Sierra Nevada and Argentina's Pampa, teaching wildlife monitoring to inner city youth, and raising two energetic sons. He also loves bicycling and wilderness travel, and practices Vipasana meditation. His varied life experiences help Gernot relate to yoga students from all walks of life, and help him transmit the essential teachings of yoga in a way that makes them come alive on and off the mat. There are yoga asana teachers, yoga anatomy teachers, and yoga philosophy teachers. Gernot is dedicated to integrating all 3 disciplines in his teachings to help you live an extraordinary life. Gernot Huber will support the team for the Pranaya Yoga Teacher Training by teaching the Anatomy and Alignment. Lek Kittikunadul was born and raised in Bangkok. While completing a Master's degree in Computer Art at the Academy of Arts University in San Francisco, he had his first experiences in yoga at the Integral Yoga Institute in San Francisco in 1995 and fell in love with yoga right away. After the death of his partner he decided to follow his heart and his passion and decided to go to India to attend a 200 hour yoga teacher training at the Sivananda Yoga Centre in Uttharakashi. Following the teacher training, Lek spent another 6 months in Northern India to experience different yoga styles. His practice, however, was truly transformed when he met Victor Chng who inspired and trained him to be a Yin Yoga teacher. Lek further deepened his Yin Yoga teaching by studying with Angela Farmer and Victor Van Katoon, who taught him the inner work of yoga. ​At present, Lek is working as the Yoga and Meditation Director at The Spa Resort Chiang Mai, Thailand. He also is a co-owner of the internationally renowned Wild Rose Studio in Chiang Mai. He teaches at Wild Rose, as well as at other yoga studios in Chiang Mai. Lek also teaches Yin Yoga classes, workshops, and retreats throughout Thailand and internationally. He also teaches regularly at the ASVZ (Akademischer Sportverband Zürich) in Zurich, Switzerland (www.asvz.ch). His teachings are focused on body awareness and deep stretches of joints, ligaments, and the fascia, as well as on freeing the flow of Qi in the body. His classes include information on the physiology and anatomy of connective tissues. He also incorporates philosophy, work with the subconscious, spiritualism, energy work, and Traditional Chinese Medicine into his teaching. During the teacher training, Lek will be sharing his vast knowledge of the energy body, the meridians in the body and how to optimally activate them in our yoga practice. He will focus on a Yin-centered practice, which will give you an alternative teaching style to offer to your future students, and will teach energetic hands-on adjustments that will allow you and your students to go deeper in your practice.